We took the number 7 bus from the centre of town and got off in Speedwell, to start roughly where the river starts, albeit underground. 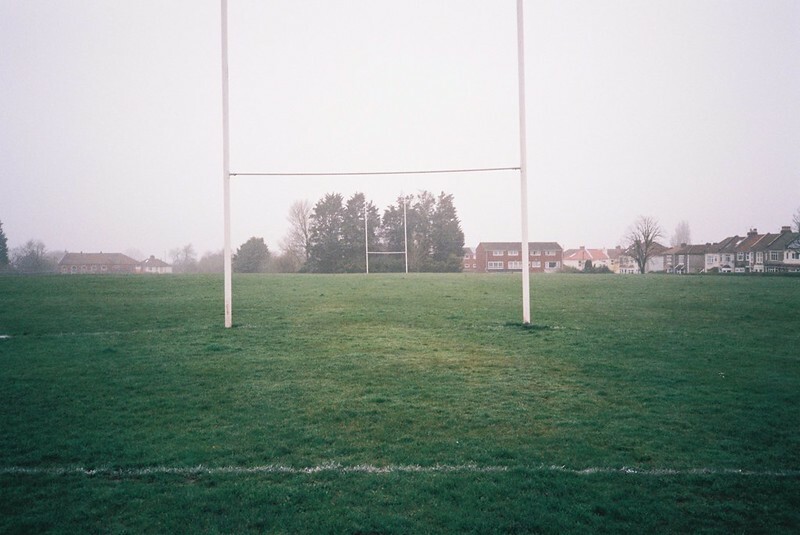 It starts under Barton Fields, a big open space with rugby pitches, that was full of mist. 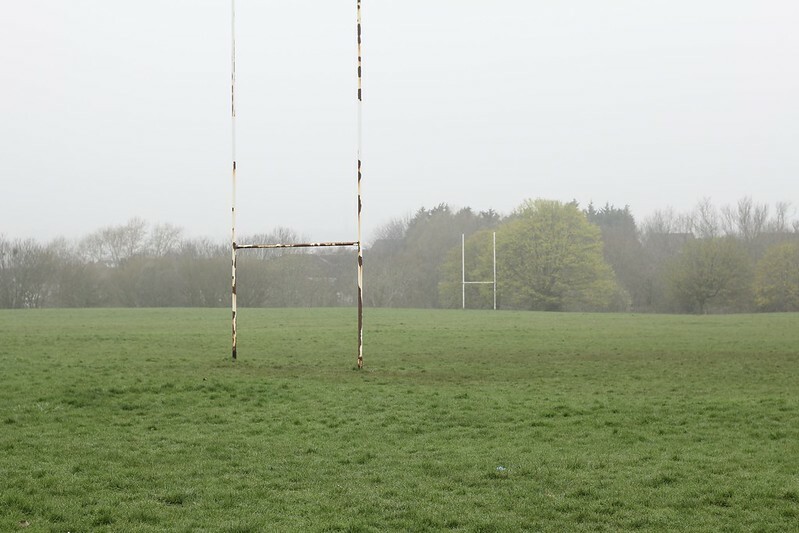 Rugby goals are so visually satisfying, but I never know if I think that objectively, or if it’s because of the time I spent at rugby clubs with my dad when I was a child. And they’re evocative for Tracy too, as a proud Welsh woman, so we were squelching across the damp, muddy fields thinking it was a good start for both of us. The field has a ditch in the middle, and a slope down to the secondary pitch, and a playground, and we were interested in the height change, but even moreso when we crossed the road and saw a glimpse the Brook for the first time, way below us in a narrow valley. This height difference really was surprising, but it was the first of many of the walk. 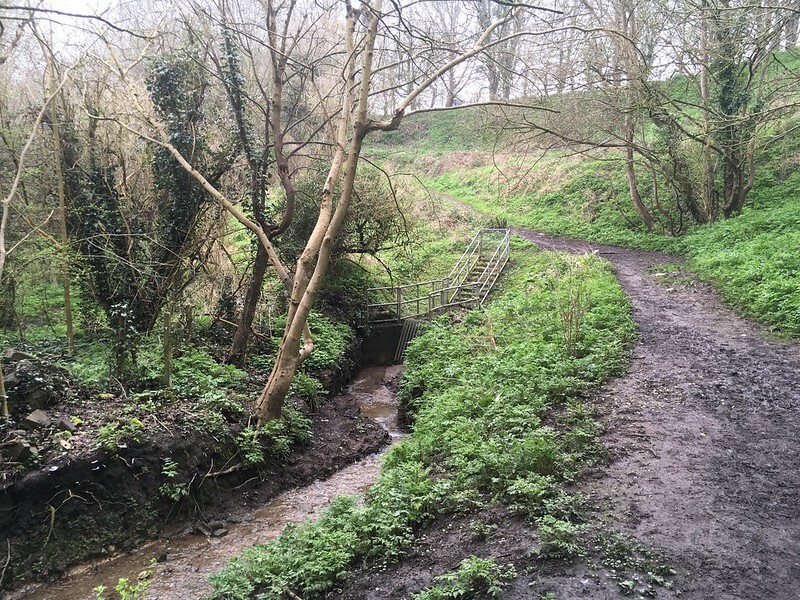 We skirted the edge of an 80s housing development, on a path lined with collapsed fences that had fallen down the steep slope, passing a group of nursery school children in hi-vis vests, before walking muddy steps into the valley – Coombe Brook Valley Nature Reserve. 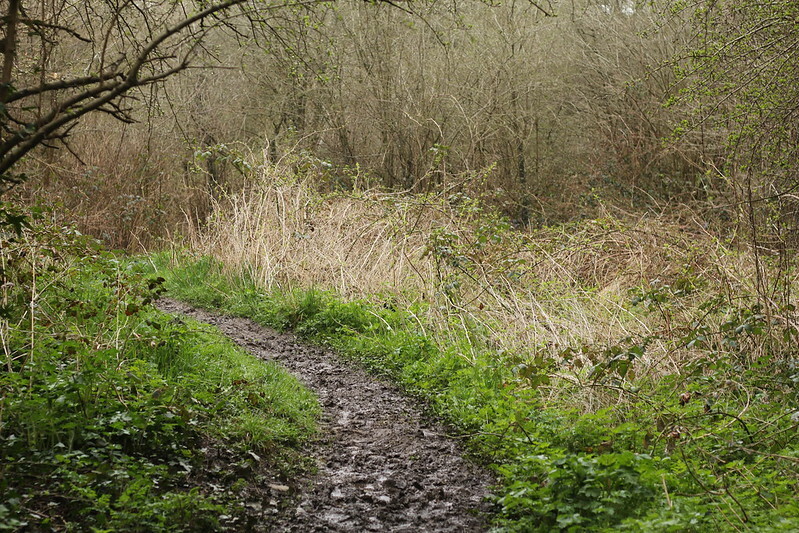 It’s this very small nature reserve, notable for how narrow and steep it is, so the path at the top is above the treetops. On the other side of the Brook, gardens come down the slope, with that patchwork of styles and fences that I really enjoy. The first has been terraced meticulously, that second is overgrown, the next has escaping bamboo, and so on. The official path runs west, but we took the desire line east, to see if we could see where the Brook began, but on that wet, misty day, after what felt like weeks of rain, it was super-muddy and slippery, and we are lucky we didn’t fall into the stream. This is the furthest east we could see, before turning back and taking the official path. The woods were small, but full of signs of spring, from the garden escapes and the horse chestnut buds at the way in, to the birdsong everywhere, and vivid green of baby leaves. Being below the roads, with trees above us, meant we couldn’t hear traffic, except for the occasional very close truck, so it was just the birdsong and sound of the water – and sounds of our feet in sticky mud, and laughter, of course. 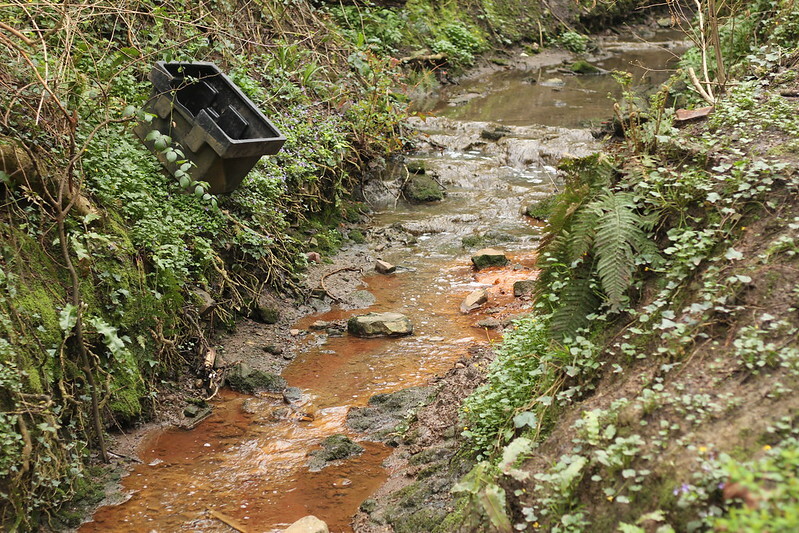 There were so many interesting things – the footbridge over a concrete pipe, the steps down from the other side of the valley – but then everything stopped when we saw the red stream. I took so many photos of this, as you’ll know if you’ve looked at the album, but it was extraordinary, so unbelievably red. 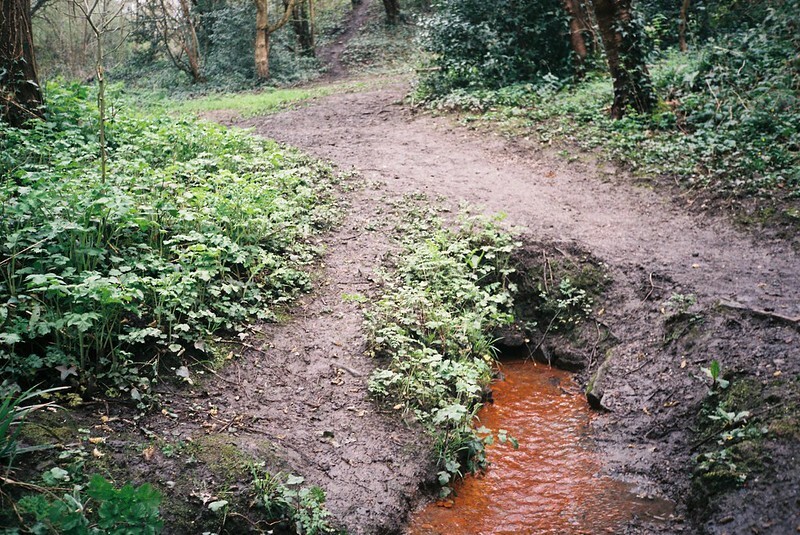 I’m guessing it’s some kind of iron deposit (hoping it’s not pollution) and no matter how red the photos look, in real life it was redder, looking unreal and dramatic as it joined the rest of the Brook. I scooped out some of the pebbles, to see if I could bring one home, but like so often happens, they didn’t look anywhere near as dramatic out of the water. But I can’t imagine what this must look like when the vegetation is green all around the red, and the sun is out. 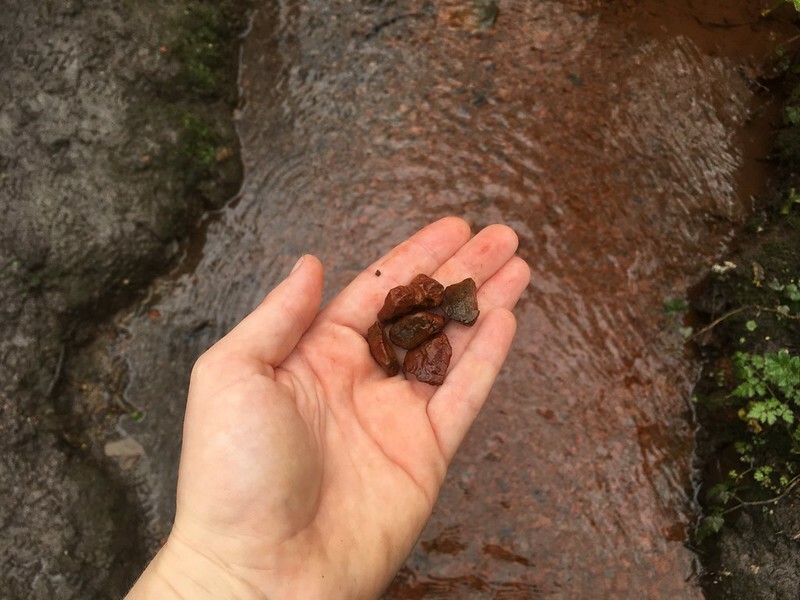 As we walked down, the red of the water faded into the brown again, and it felt more and more like we were walking into spring. 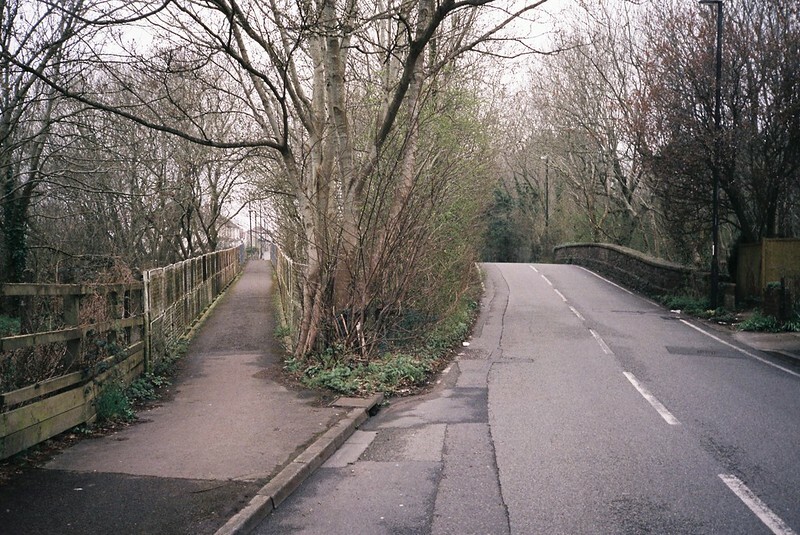 We stopped on the next footbridge, a crossroads with paths in all directions. Again, the footbridge was over circular pipes, a motif that continued down the river, and it got me thinking about the different characteristics of little rivers – how the Malago and Pigeonhouse Stream have weirs that are stepping stones, for example, and how the Trym in Blaise Estate has disturbing footbridges like cattlegrids, and it seems Coombe Brook has the concrete pipes. I’m wondering how common this is? 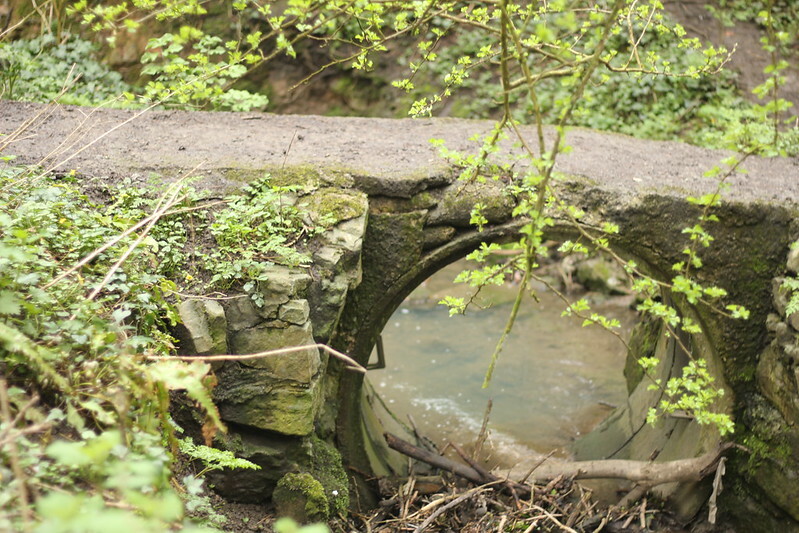 The Brook also had strange concrete sections in it – functional weirs, but also concrete on the bed of the river, and I’m not sure why. 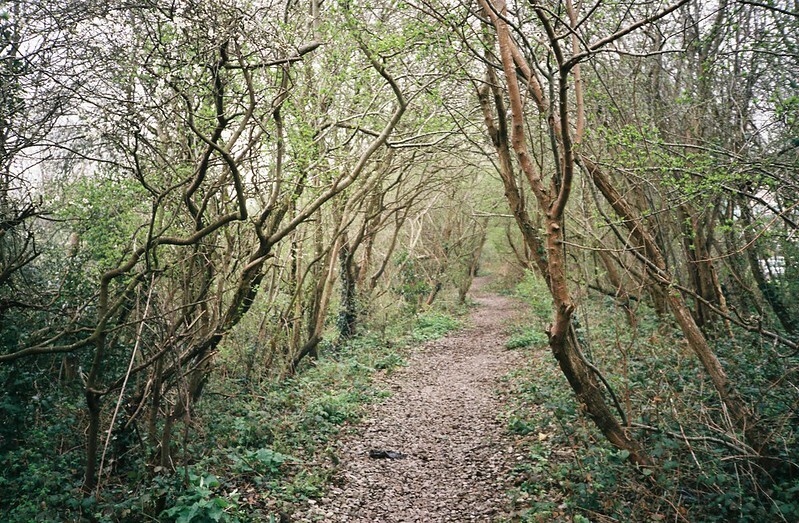 We followed a southern path, through boggy ground and up onto scrubby land, that felt like an abandoned sloping orchard, and past more desirelines and bushes full of blackthorn flowers and silver-white buds, the kind of unused space that feels so rare in the city these days. Then back along the river, until it vanished underground, under one of those ugly grates, the steps down to it covered in the remains of strimmed undergrowth. 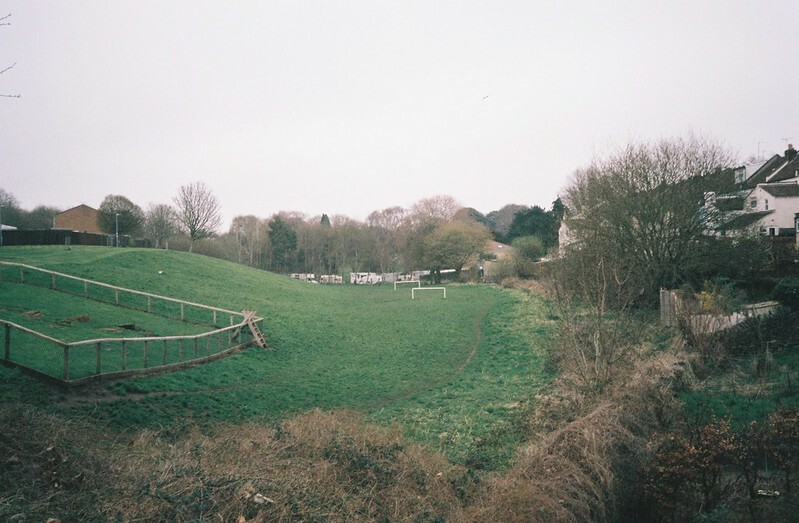 At the end of the field, it drops down again, to the Bristol and Bath Railway Path, the beautiful cycle path that runs on a former railway line, north-east through Bristol, then curving south round the edge of the city, joining the Avon and running to Bath. 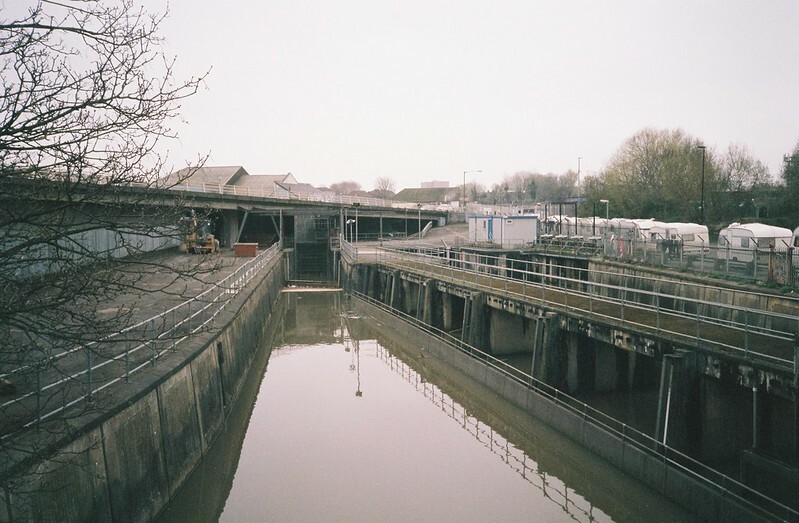 It’s one of Bristol’s jewels, and predictably, for this city, it’s under threat, as every ten years there are plans resurrected to turn it into a bus lane, which get shot down, as it’s such an important commuter route and green corridor, especially as it passes through the densely built Easton…. but then like something out of a horror movie, the plans fail stay dead, and come back to be fought all over again. Here’s hoping the rumblings about building on it last year will disappear quickly. The height differences were really interesting, again, with the rugby ground feeling like it was “ground level”, and the railway path in a cutting below it, but knowing below that again, there was the Brook. 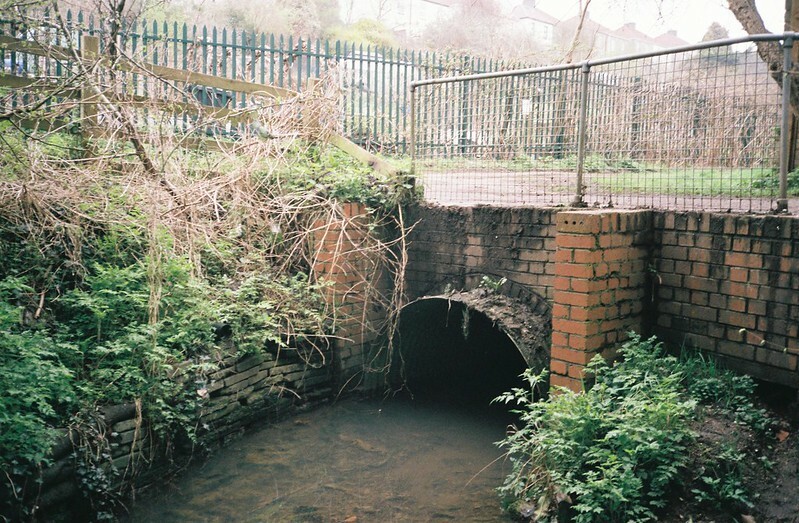 The line of the Brook runs straight underground, but we detoured off route, over the double bridge, because I wanted to check out something marked on my OS map as Bristol Lido. On the map, it looks like a lake, and there seemed to be a way in, but while we could see a glimpse of water, it was very definitely fenced off. 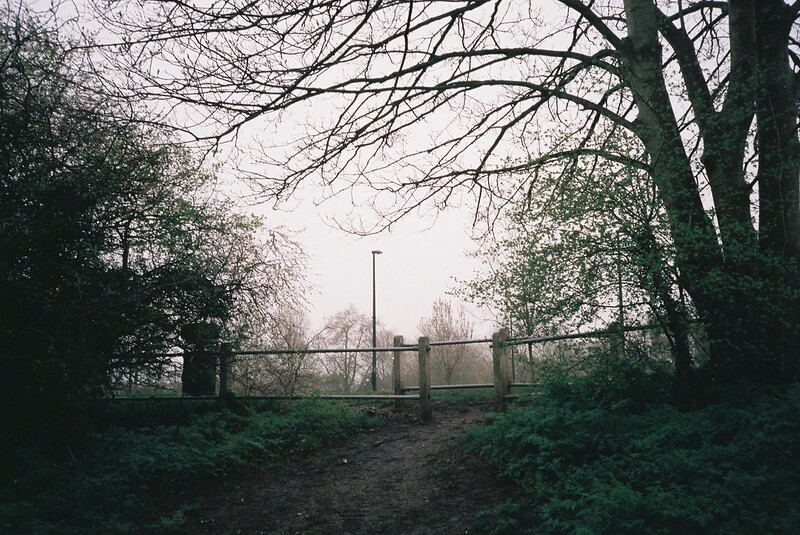 We scrambled down to the path, and up a footpath branch into the Lake View flats, hoping to see more, and at the end of a car park, we could see a little bit through the bars of the gate. The gate was full of signs about no overnight fishing, illegal drugs being absolutely prohibited etc etc. So strange to know the lake is so much higher than the railway and the river below it, but looking on Know Your Place, it looks like it was a clay pit – and it looks like those rugby grounds were also clay pits and excavations, and the river ran open until the 1940s, though I have no idea if it was always that deep, or when the pits were dug down, it took the lowest line. I need to have another look at that, because old maps, amazing. 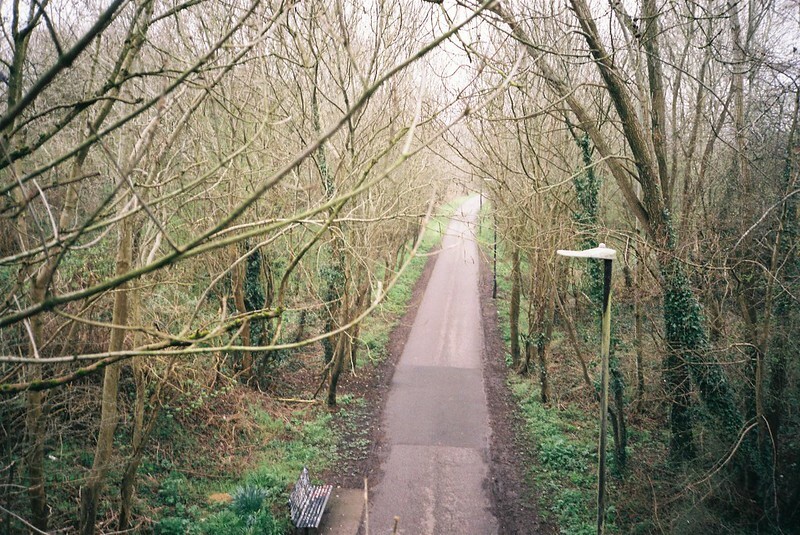 We diverted down the traffic of Fishponds Road, a rare patch of traffic that day, and found the footpath between houses. The path is steep, lined by leylandii, with the sound of water behind the fence. As it went down and down, the path narrowed, and then at the bottom, took a turn, and the river appeared again. 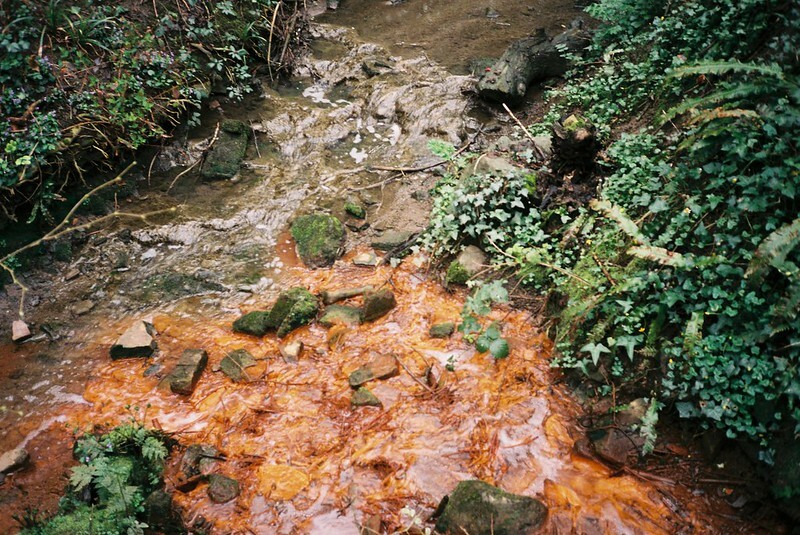 It was red water again, until it ran down a concrete slope, with a tiny waterfall as it turned a corner. We followed it, to houses in the bottom of the valley on one side, and a huge fence alongside Dubbers Lane Allotments – and then a little gate through the side, and we could get back down through the pretty idyllic allotments to another footbridge, and back to the river. 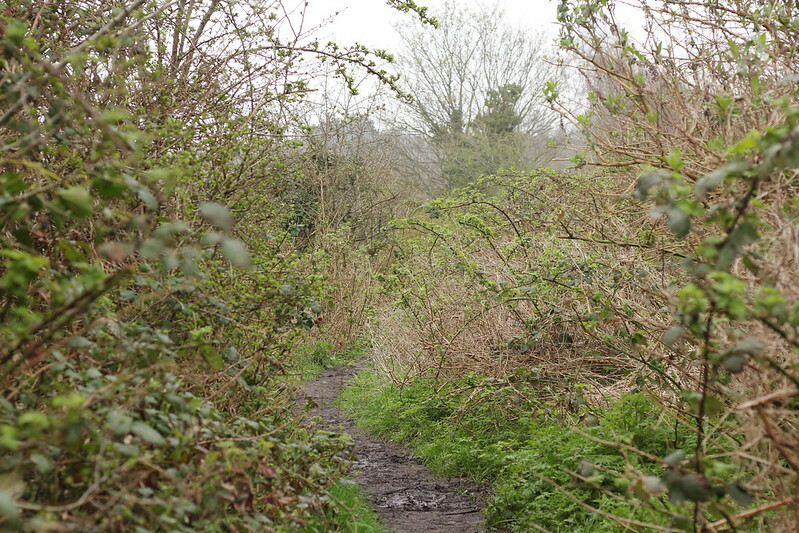 The next section was a lane down between more of the Bristol City Council unfriendly allotment fencing. I’m not sure how best to describe it, but it’s dark green, with vicious spikes, very corporate, on allotments all over the city. 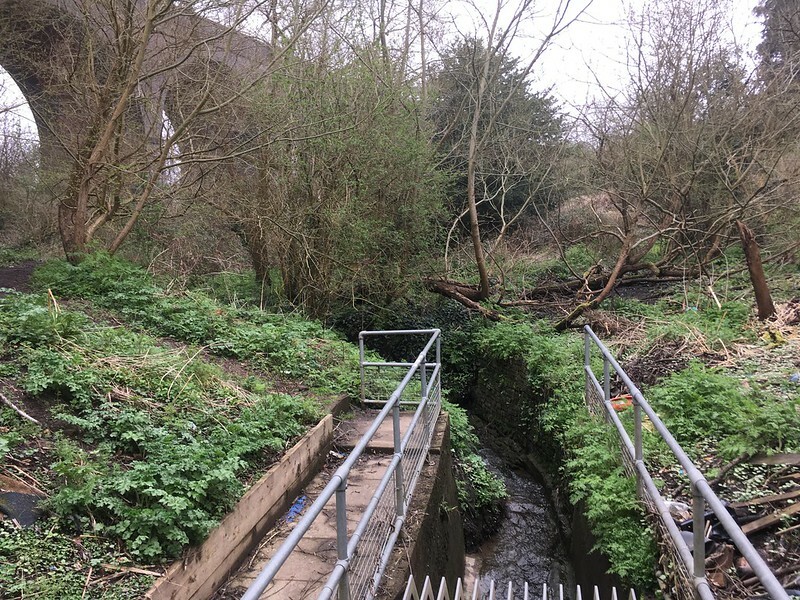 The Brook splashed alongside the path, then went underground again, under car parks and gardens, again with that mishmash of fence and walls that characterise alleyways. 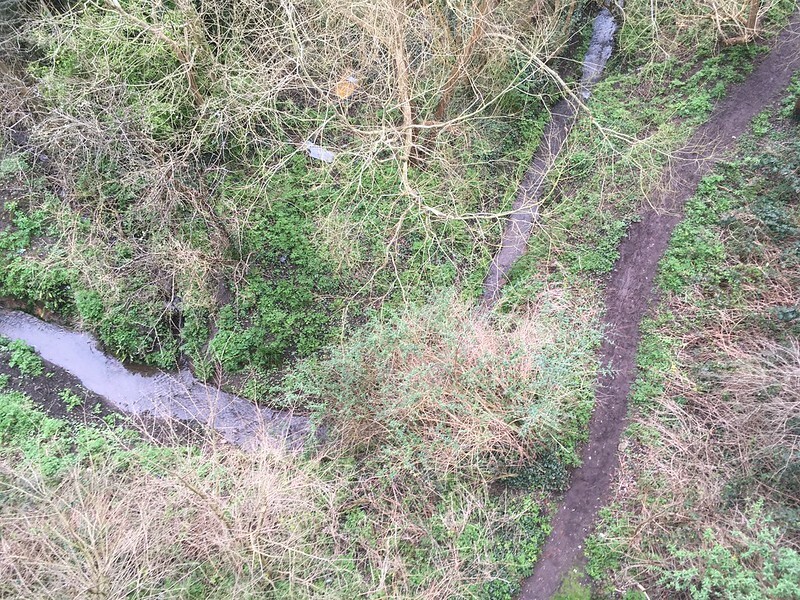 After a while the Brook reappears, from a pipe, making this bizarre moaning noise that I wish I’d recorded. I don’t know if it’s something about coming out of winter, but was very muddy, with a section of drystone wall and then a wall of little sandbags holding up the banks. It’s fun trying to imagine what the river will look like as summer comes. Will it be full of Himalayan Balsalm? How green will it get? Through more allotments, and I’m always interested in how different allotments have different cultures, or characteristics. These ones, Clay Bottom and Royate Hill Allotments, seem to have a lot of sitting areas, little shed-lets or bowers, from woven willow to a posh little shed on the slope with a satellite dish. But what really made me excited was seeing the Royate Hill Viaduct coming out of the mist. I was very, very excited about this viaduct, because it’s the nearest thing Bristol has to New York City’s High Line: a nature reserve that includes what looks like a wildflower meadow on top of the former railway viaduct, and at either end, two steep embankments. It’s called Royate Hill Nature Reserve, and I’d never heard of it until I was having my usual walk-preparation map indulgence. I’ve probably been under this before, and I don’t think I would have noticed the trees on top of it, but I couldn’t wait to see it, after indulging in a ton of googling. 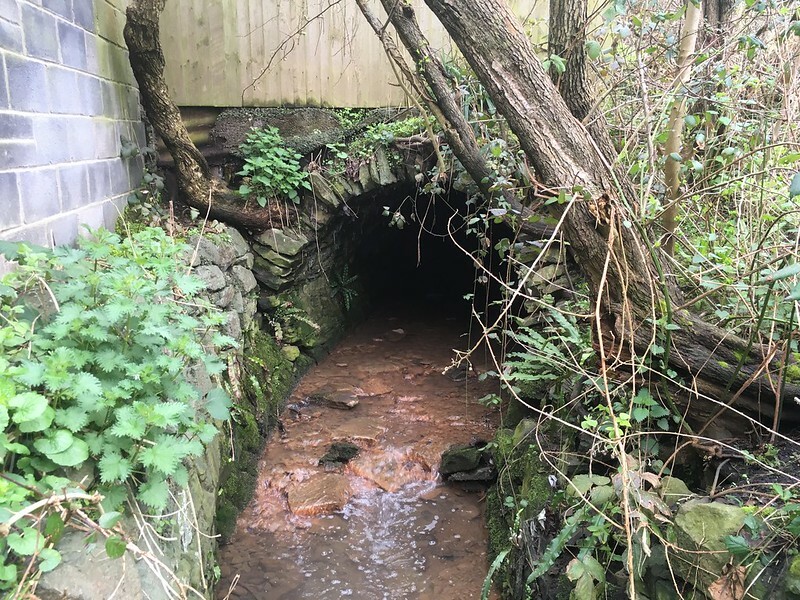 First, we took the little gate opposite the lane, and walked under the arches, and along the Brook for the last time it is above ground before it joins the Frome. 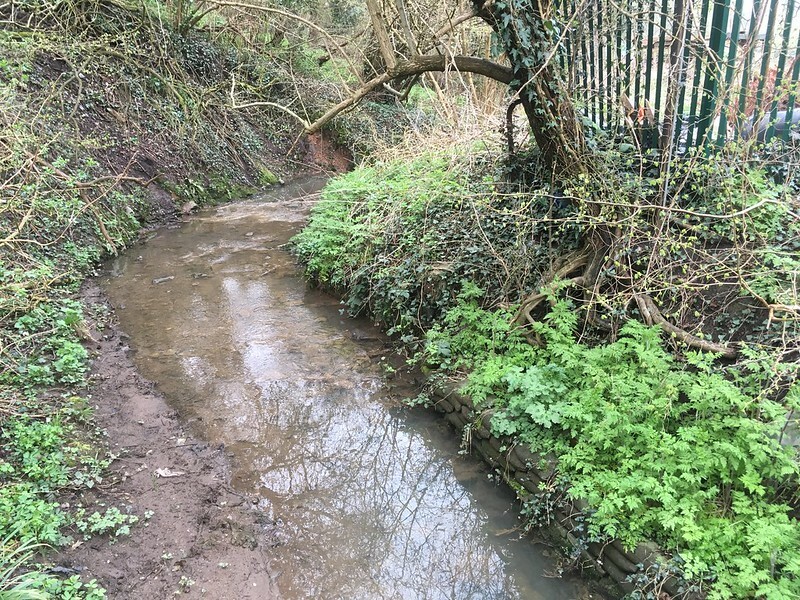 It acts as a boundary between the nature reserve and Greenbank Cemetery, and then disappears under the cemetery, and I have to admit I’m surprised by this, because waterways and burials are so often a bad mix. It was sad to leave the Brook, but there was the viaduct to explore. Of course we went a stupid way in (I am amazed Tracy trusts me, because I’m always doing this to her) as we skirted the edge of the steep railway embankment, and then careening up the slope following a desireline, grabbing branches for support and hoping they wouldn’t break off in our hands. 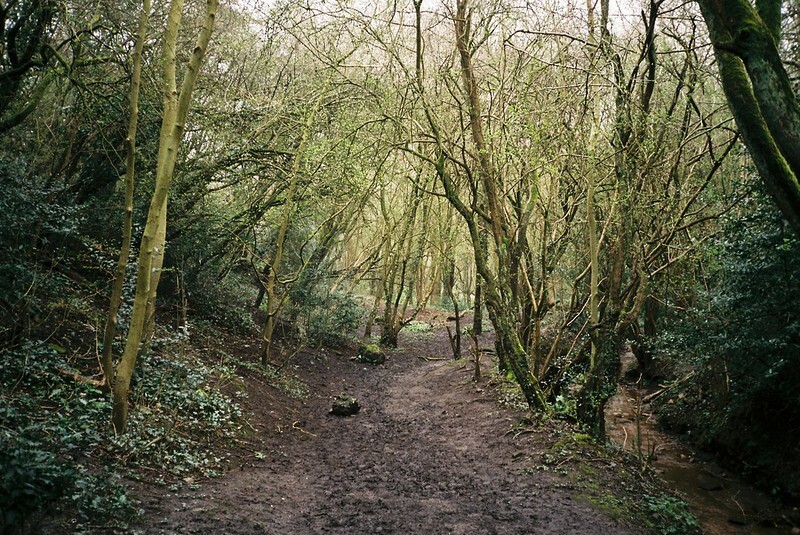 At the top, a little roofless railway hut, and then the path through brambles and buddleia, and scrubby trees. It looked like it could be a path through any kind of woodland or wasteland, until it opened up, and we could see how far above the houses we were, and the viaduct stretching out ahead of us. Being on top of that viaduct is just extraordinary. On a misty day, we didn’t get the views that I bet are wonderful up there, but still, it was fantastic. 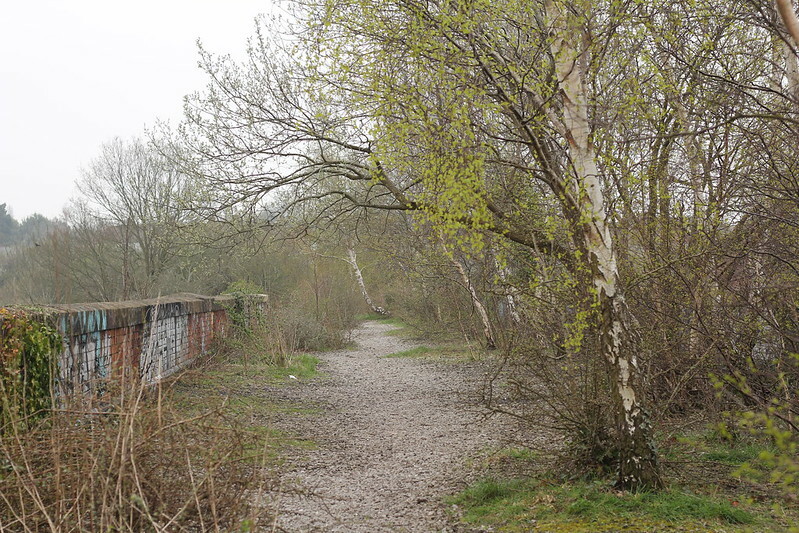 The walls are chest height, and the surface is the typical clinkers of a railway line. Silver birches doing their pioneer tree thing, making us wonder how deep the roots go, and what they’re doing to the viaduct. Signs of spring, but wow, I want to see what it’s like in the other seasons. 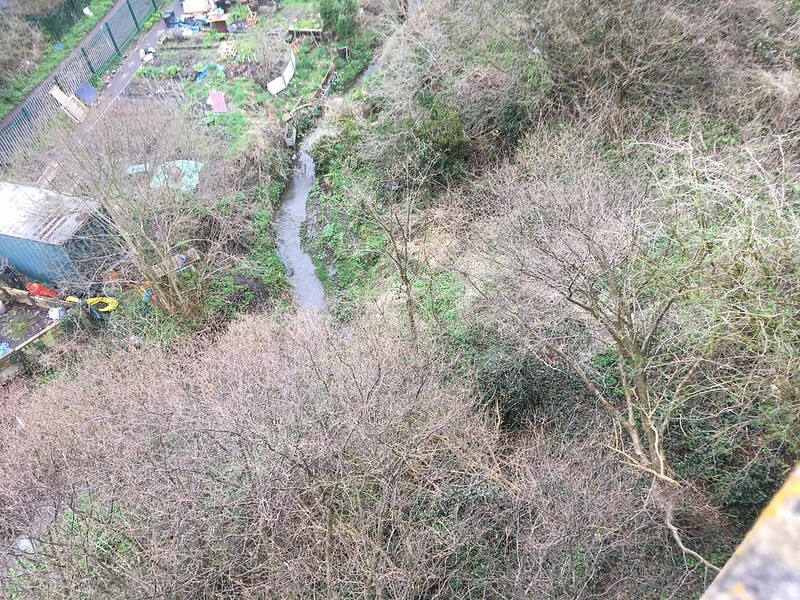 and a couple of mobile phone pictures looking over the edge – Coombe Brook to the east through the allotments, and then as it skirts the edge of Greenbank Cemetery to the west. That’s the path we walked on! That kind of thing gives me the shivers. At the other side of the viaduct, the reserve continues on the embankment, with council flats on one side, and the allotments, and what turns out to be a community orchard, full of primroses, on the other. 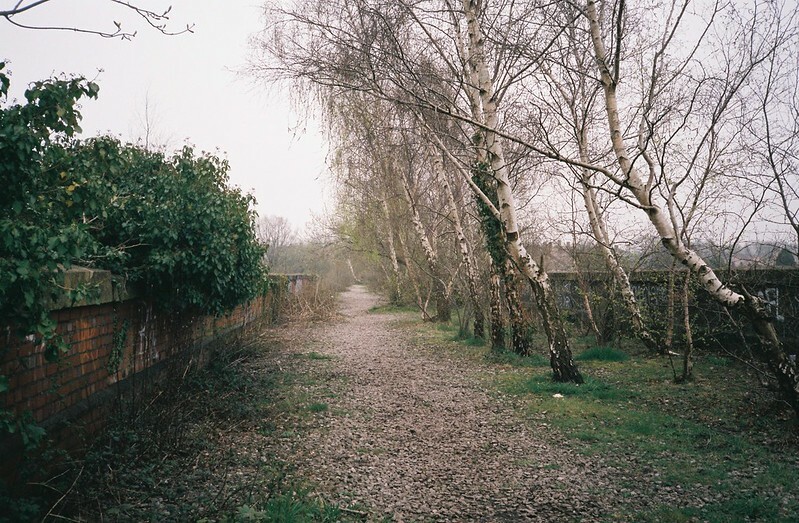 I’m guessing that the reason it got turned into a nature reserve was because there was a threat it would get knocked it down so that the flats’ green spaces and the allotments could be built on, but keeping it there not only is a fantastic, unusual space, it also protects the land around it. We walked crunching on the path between the trees leaning into each other overhead, and then at the end, it just comes to an abrupt end, a steep cliffside down to a road, and opposite, where the embankment has been cut through, or there once was a bridge, more 80s houses. There’s a steep desireline up to the embankment from Clay Bottom, if you want to come from that way from the Railway Path, but it would be a scramble up. Back over the viaduct again, with 100 more photos, and back the way we came, but along the path, which ends (or starts) with steep steps down to the gate to the Reserve on Edward Street. At this point, we could have looked for the Moon Temple (OMG!) or explored the cemetery, but I was having one of those low blood sugar moments, and we both needed a coffee, so we looked up the nearest café, and headed off. We walked down the road alongside the cemetery, Greenbank View, and this became an uncomfortable moment. It starts like a normal Easton street, but with the cemetery wall and fence on one side; and then there are a couple of vans parked along that; and then some caravans; and then as it dipped downhill, there were vans and caravans on both sides of the road, and it was clear it’s a Traveller site, and maybe we shouldn’t be there. It’s a hard feeling to describe – like we were trespassing into a community’s space, that it was something that if we were local, we’d know was there, but being outsiders, we were surprised by. If I was a different kind of photographer, I would have taken photos of all these different adapted vans and vehicles, but I feel super-uncomfortable about doing that kind of thing. I wouldn’t take photos in people’s house windows, so why feel ok with doing it with a van? A big dog lying in the road had us a bit worried about if it really was ok to walk here, and looking on the maps, I’d wanted to explore Rosemary Green, where the river runs underground, and which was the site of a paupers’ mass grave, where people who died in the Eastville Workhouse had been unceremoniously dumped. 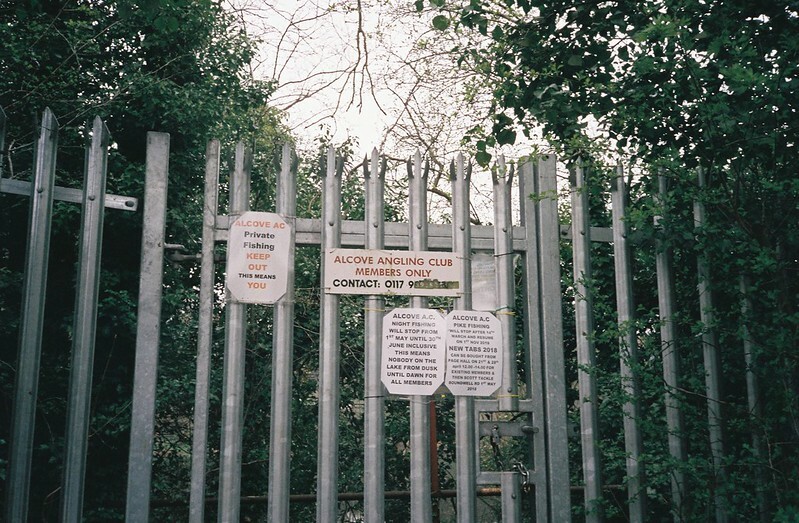 I’ve read about in the Bristol Radical History Group project uncovering the history, and putting up a memorial there, but now it is a campsite for…. I don’t know – Travellers? Rough Sleepers? I never know where the lines are between rough sleepers and homeless people and New Age Travellers, or if it matters, but the recent trend of public spaces getting edged by tents is really disturbing, because for a decade or so, it really had felt like the homeless problems of Thatchers’ Britain were being solved in the 2000s, and now they’re back again, twice as bad as they were before. Of course, cutting social housing + homeless services + mental health services + drug/alcohol services etc etc, and enacting laws that make landlords have to act as immigration police, and zero hours contracts, and the bedroom tax, and so on, all this makes a rise in homelessness inevitable. It’s one of the horrors of living in 2018, that we’ve had a winter of people huddled in doorways in the snow, that there are unofficial sleeping encampments that keep getting moved on out of the centre of the city, and that now the weather’s improving, the tents are going up on the banks of the Avon again, a dangerous place to camp because of the tides, and it feels like there’s nothing that can be done about it. If we’d taken this walk 5 years ago, we wouldn’t have passed people sleeping under the footbridges, tents at the corners of fields, but it’s become a “normal” sight, and in such a short space of time. And of course, camping on, and sleeping in vans next to the former mass grave of a Poorhouse is like some kind of sick joke. So we walked on, because what else could we do? We went through Easton, and contributed to the gentrification by having overpriced coffee and cake in one of the new hipster cafés, then doubled back on ourselves, crossing Rosemary Green from the other side, and picking up the line of the river again. I’d guess that it maybe runs under the scrub between the desireline and the back gardens – and maybe the fenced section is the burial site, now I look at the photo? But we went the other way. 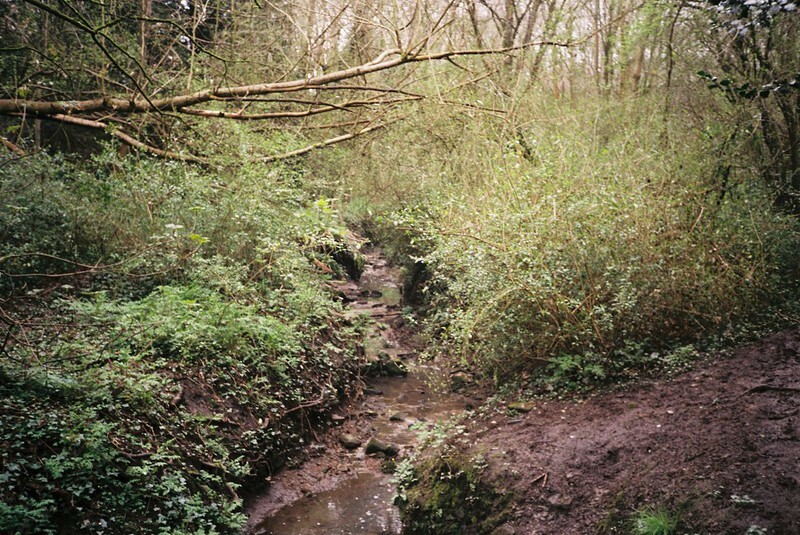 We walked down back into the city, crossing Stapleton Road and under the M32 motorway, to the River Frome. 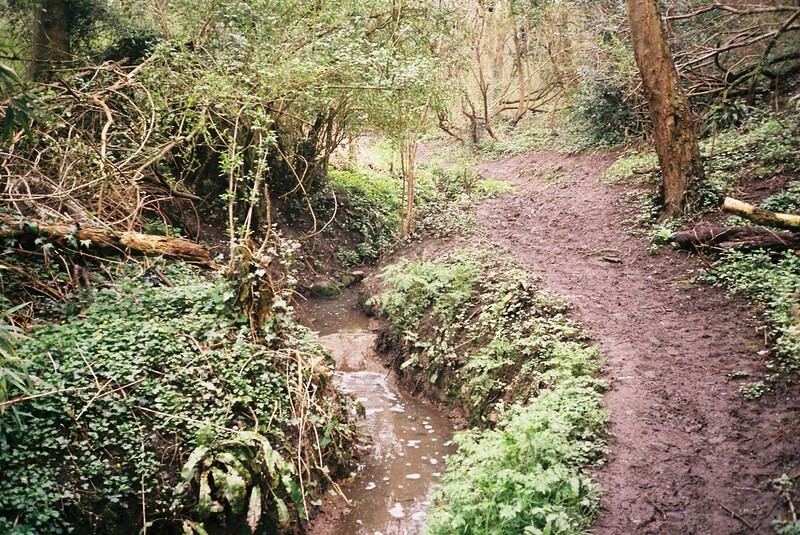 I couldn’t tell exactly where Coombe Brook runs into it – maybe at the grating at the end of this run? I’d love to think that, but I think maybe, according to the Big Blue Map of Bristol, it’s a little further north, maybe even under our feet? 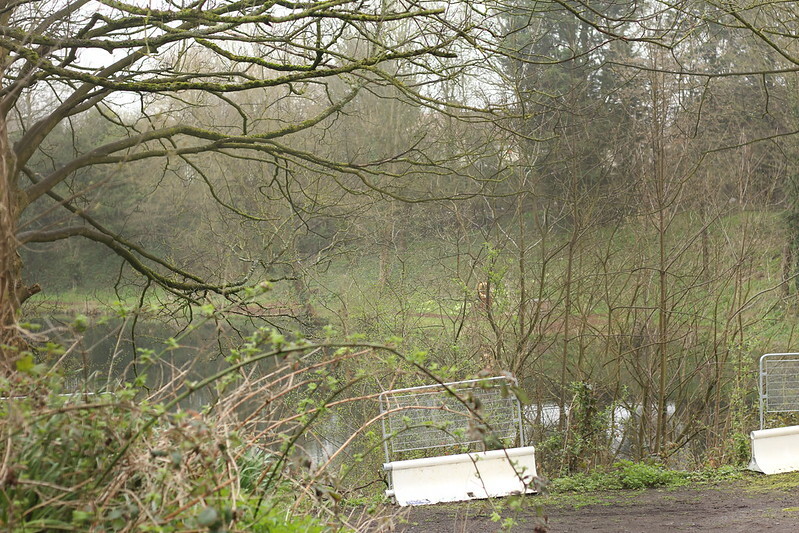 And yes, that’s another traveller site on the other bank – there’s another one further north under the M32, and I wonder, is anyone giving them support services I know were around in the 2000s, helping travellers access healthcare, education and so on, or are they just abandoned there? 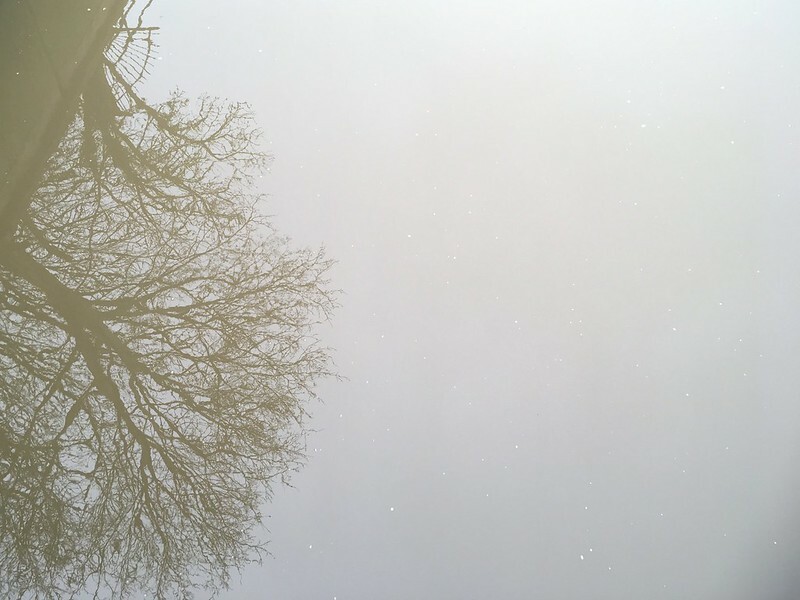 The Frome was murky and grey, reflecting the weather, and it disappears under the motorway here. We left the river, and headed back through Easton, to pick up the railway path and walk back into the city. My thanks, as always, to Tracy, for being a superb walk-companion. Thanks for the conversation and the energy bar, for following me along muddy slippery paths, and putting up with my blood sugar crash and moments of stress! 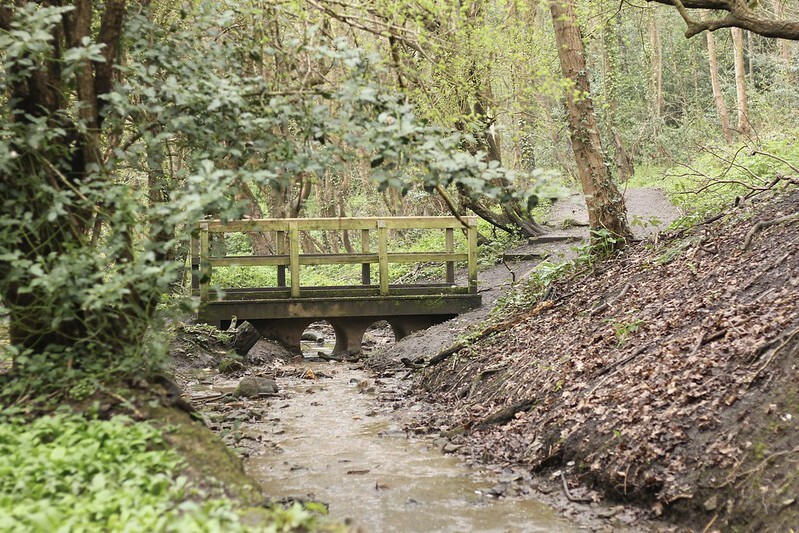 This is a great ode to Coombe Brook! 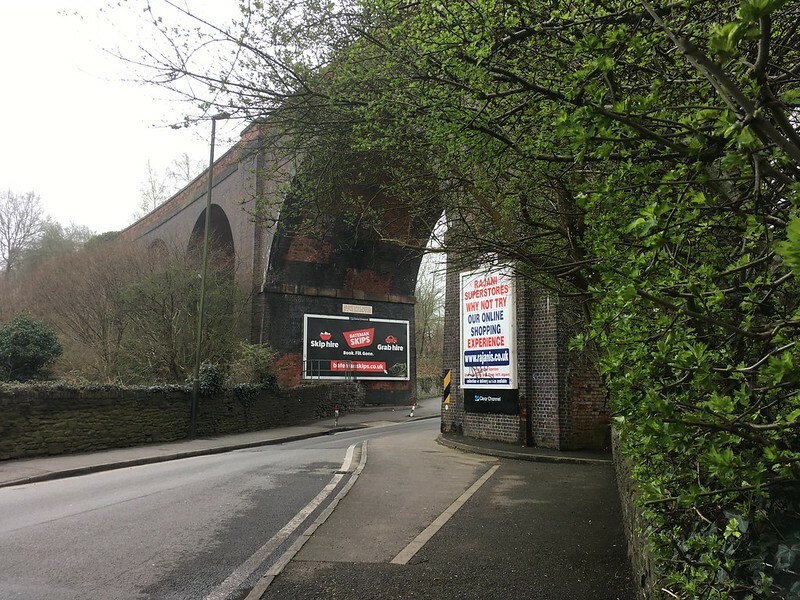 Since moving to Fishponds just a year ago, I’ve been walking my kids to school over the Royate Hill viaduct every time we could (when it wasn’t too muddy…). 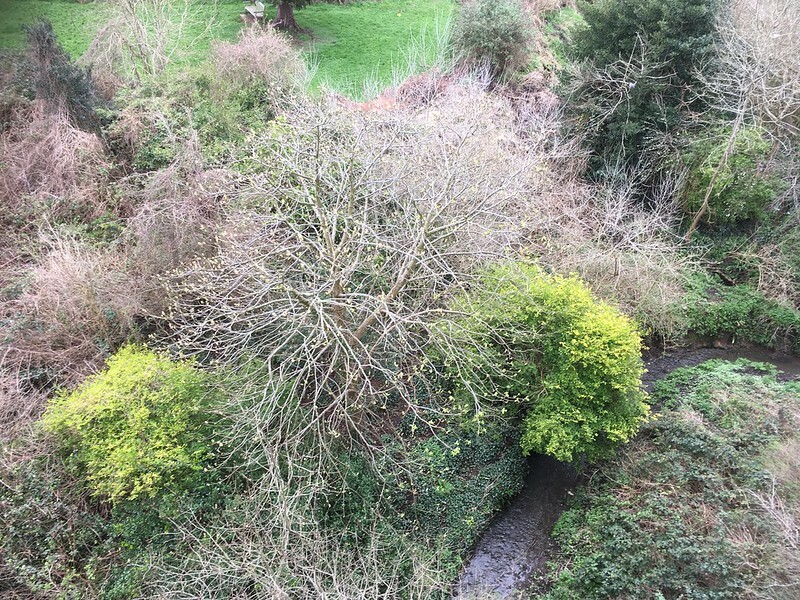 We’ve seen the creek and the allotments down below in every season: in misty fog or frosty, in the snow, in spring full of overgrowing blackberry bush. A lot of people, even locals, don’t know you can actually walk over the viaduct! Its history is interesting too. Apparently there were two train lines connecting local factories to Bristol centre and an even bigger viaduct near the current Ikea that was demolished to make room for (not as appealing) M32. I wish there was an easier way to climb up onto the Royate Hill viaduct, there might have been steps at a certain point, but we do carefully hike our way up, again, mud permitting. “Traveller” vans have been a real problem and made it really unpleasant due to all the rubbish (the school had to close the rear entrance once because of a clogged drain!). They’re now gone, not sure where to. They’ll pop up somewhere else. Bristol seems to attract more van and rough sleepers possibly due to its milder climate. Anyway, in the future we might move further away, closer to Coombe Brook proper. 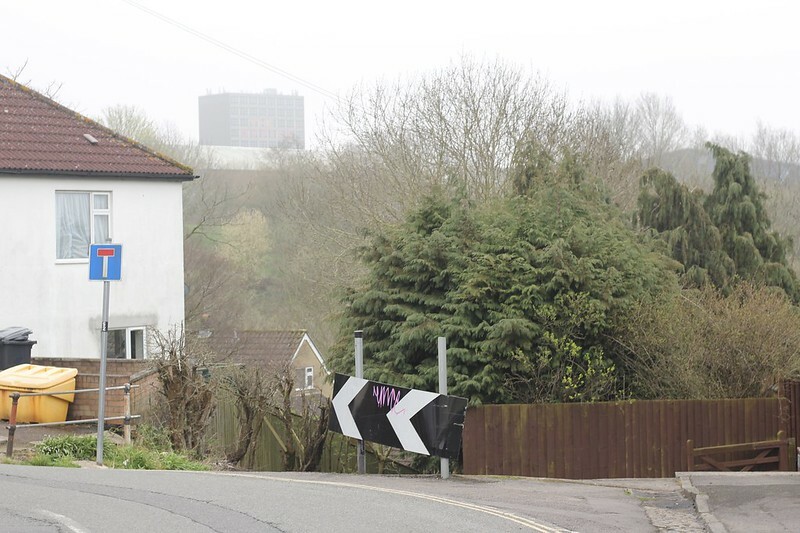 We’ve spotted one of those 80s houses you saw with steps down to the bush and we’re keen to have a look! We’re so spoilt by nature here in East Bristol with bush, water, birds and bats, and you’ve captured it beautifully.